FASIC is pleased to announce the opening of the 4th round of the BHP Australia China Scholarship (the Scholarship). The Scholarship was established to encourage and assist students and young professionals to pursue specialised study, research and experience in priority areas of interest in the bilateral Australia-China relationship. The application is open till Monday 16 June 2019. Click here to download the FAQ’s for more information about the Scholarship. Click here to download a copy of the application form. Call for Papers: Special issue of the Journal of Australian Studies (JAS) - "Australian Studies in China". The deadline for manuscript submission will be 31st May 2020. JAS is an initiative between the Chinese Association for Australian Studies (CAAS) and the International Australian Studies Association (InASA). Click here for more details. Inaugural BHP Chair of Australian Studies at Peking University, Emeritus Professor David Walker AM, has just released a new book, Stranded Nation. White Australia in an Asian Region. For more information on Professor Walker's book, please click here. 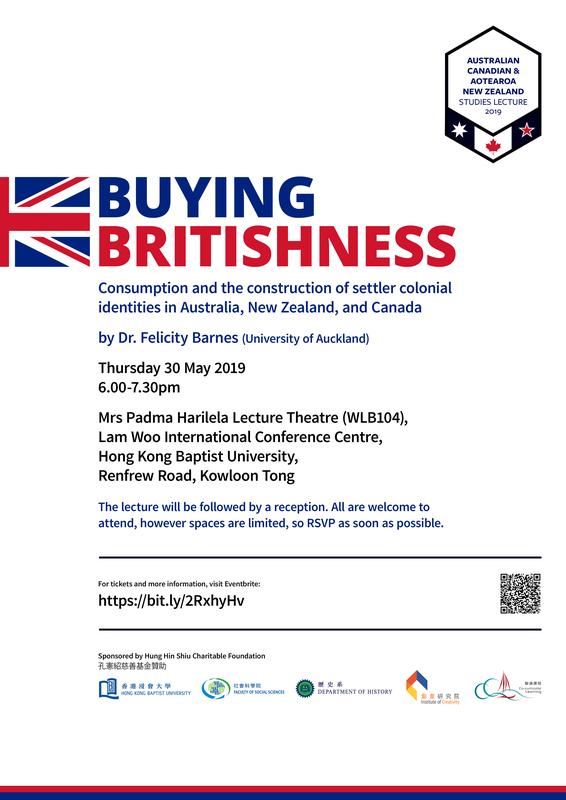 You may be interested in the inaugural Australian, Canadian, and Aotearoa New Zealand Studies Annual Lecture which will be taking place on Thursday 30 May 2019 at 6pm at Hong Kong Baptist University. Click here for more information. FASIC is very pleased to announce the results of the 2018 Australian Studies in China Program (ASP), jointly funded by the Australia China Council and FASIC. We thank all the applicants for their interest and effort in the Australian studies. Congratulations to the successful grantees. Click here to view the list of the grants. The handbook of the 6th FASIC Conference titled Global Connection: Space. Place and Shared Destiny is now available, click here to download. The draft program of the 6th FASIC Conference titled Global Connection: Space. Place and Shared Destiny is now available, click here to download a PDF copy. The Foundation for Australian Studies in China (FASIC) is delighted to announce the successful scholars who have been awarded 2018 BHP Australia China Scholarships. The focus areas of these BHP Australia China Scholars cover such topics as bilateral trade and economics, governance, international politics, as well as Australian studies. FASIC congratulates the four scholars from Australia and China for their academic excellence and their strong desire to contribute to the deepening of the Australia China relationship. I intend to use the scholarship to pursue a range of academic and professional interests pertaining to the Australia-China relationship. As Australia's most important trading partner, understanding China's economy and the nature of bilateral trade will be central to our mutual prosperity moving forward. Furthermore, China's position as the most strategically significant Asian nation makes cross-cultural and political understanding between both our nations paramount to securing a stable region in which trade can thrive. It is my aim that by studying at Peking University I can develop the skills and economic acumen necessary to ensure a positive relationship between our countries. Given the central role of the Chinese language in business and cross-cultural understanding, I intend to use my scholarship to pursue further language study with the aim of acquiring a translation certificate. Additionally, the receipt of this scholarship will assist with a range of other essential expenses related to internships, exchange and research. I am delighted to have been awarded a 2018 BHP Australia China scholarship to undertake a Master of International Affairs at Peking University. As part of this degree, I will be taking a range of courses, focusing on topics around the Australia-China relationship, Chinese strategic policy and security, and sustainable development. I will also be continuing to study Mandarin language to guide my understanding of the Chinese context. I will be supported not only to live and study in China, but also to pursue my interest into contemporary Chinese domestic politics, and, the role of women in developing China's national policy agenda. Alongside my studies, I am intending to undertake an internship with a strategic advisory group and to be involved with a range of women's and Australia-focused networks and social groups. I feel that these experiences will enhance my academic experience and provide greater context to my understanding of China and its place in the world. My intended course of study is in the field of International Politics, pairing a wider international relations analysis with a focus on diplomacy and government in China. Within my studies, I have always centred issues of gender, race and sustainability, which I plan to maintain as a lens of analysis in my upcoming studies. As a growing power on the world stage, China is central to global trade and relations. As such, it is in diplomacy and trade deals both with and by China, that change can be affected to achieve humanitarian aims. Knowing this, I applied for, and was admitted to, a double degree Masters of Government and Politics at Shanghai Jiao Tong University, and Master of International Relations at Monash University. This pairing of domestic and international studies in Australia and in China provides a unique spread of knowledge across both Eastern and Western political theory and trade. Receiving this scholarship has given me the opportunity to take up this degree. With the funding from FASIC and BHP, I am able to focus on my studies and the writing of my thesis, which I would otherwise not have been able to do. I look forward to learning from and contributing to the growing field of feminist international political economy and international relations, and am grateful to have had the chance to focus on my passions in the centre of global trade, politics and growing industries. I am extremely grateful to FASIC for providing me with this rare and unique opportunity to pursue my academic and professional interest in policies and practices of teacher education in Australia and China and to continue forging strong ties between the two countries. Policies and practices of preservice teacher education are of high importance in the development of quality teachers. The proposed study will examine the policies and practices of preservice teacher education in Australia and China and accentuate the effective approaches and best practice of initial teacher education programs implemented by both countries to promote student teachers’ professional competence. Both countries experience problems and challenges in developing sound policies and implementing them. By adopting a qualitative approach to scrutinize the implementation of current policy from the perspectives of teacher educators at Deakin and Inner Mongolia Normal University, this study will focus on the teacher educators’ perceptions of the policies and practices of preservice teacher education in Australia and China. The ultimate findings will not only make contributions to the current studies of pre-service teacher education in Australia and China, but also provide theoretical implications and practical suggestions for both countries. FASIC is pleased to release guidelines for 2018 Australian Studies in China Program (2018 ASP), jointly funded by the Australia China Council and FASIC. Click here for more information. FASIC Announces new BHP Chair of Australian Studies at Peking University. Today, FASIC announced that Professor Pookong Kee, of the University of Melbourne, has been named as the next BHP Chair of Australian Studies at Peking University, to be based in the School of International Studies at Peking University. Click here to view the announcement. Australian Foreign Minister Julie Bishop welcomes the appointment of Professor Pookong Kee as the next BHP Chair of Australian Studies at Peking University. Click here to view the Foreign Minister’s statement. Warmest congratulations to Emeritus Professor David Walker AM, FASIC Director and the inaugural BHP Billiton Chair of Australia Studies at Peking University, for being awarded a Member of the Order of Australia “for significant services to education in the field of Australian Studies and to international relations”. Click here to read the media notes on David’s service. SAVE THE DATE. The 6th FASIC International Conference titled: Global Connections: Space, Place and Shared Destiny will be held at Sichuan Normal University, Chengdu, China, 1-4 November 2018. This conference is hosted by Australian Studies Centre at Sichuan Normal University (www.sicnu.edu.cn ) and co-organised by the School of International Studies at Peking University (http://www.sis.pku.edu.cn/ ). For English version of media release, click here . Click here to register. More information to come. CALL FOR NOMINATIONS - Nominations are now open for the Biennial Australian Studies in China Book Prize to be awarded at the conference of the Chinese Association for Australian Studies in June 2018. Please click here for more information and the nomination form. FASIC is pleased to announce the opening of the third round of the BHP Australia China Scholarship (the Scholarship). The Scholarship was established to encourage and assist students and young professionals to pursue specialised study, research and experience in priority areas of interest in the bilateral Australia-China relationship. The application is open till Friday 25 May 2018. Click here for more information about the Scholarship. Click here to download a copy of the application form. Western Sydney University is now offering a unique Master’s program in Chinese Cultural Relations, intake starts July 2018. Click here to view the brochure. FASIC is very pleased to announce the results of the 2017 Australian Studies in China Program (ASP), jointly funded by the Australia China Council and FASIC. We thank all the applicants for their interest and effort in the Australian studies. Congratulations to the successful grantees. The grants are conditional and subject to the signing of a funding acceptance form. Click here to view the list of the grants. The Foundation for Australian Studies in China is seeking Expressions of Interest from qualified applicants for the BHP Chair of Australian Studies at Peking University to start in early 2019. Click here for information. FASIC is an independent non-profit foundation in Australia established to support Australian Studies Centres located across China and to provide funding and other support to the BHP Billiton Chair of Australian Studies located at Peking University in Beijing, People's Republic of China. Support programs or activities that enhance the mutual understanding and engagement between people of Australia and China. Enhance the understanding of Australia in China through funding and other support provided to Australian Studies Centres. Provide scholarships for educational exchanges between Australia and China as well as funding support to a Chair of Australian Studies.